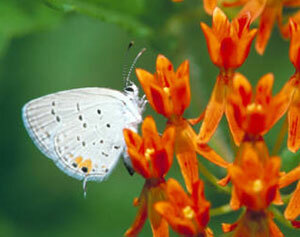 Butterfly gardening has become one of the most popular hobbies today. What could bring more joy than a beautiful butterfly fluttering around your garden?! Here are some tips to make your garden especially butterfly-friendly. Your first step should be to find out which butterflies are in your area. You can do this by spending some time outdoors with your field guide to see which species are around. Amazon has a great selection of Butterfly Field Guides . DO NOT USE PESTICIDES IN YOUR GARDEN! To learn how to garden organically, click here. Butterflies use two different types of plants - those that provide nectar for the adults to eat (nectar plant), and those that provide food for their offspring (host plant). It is best to find out which plant species are native to your area and plant those rather than exotic species. You can find a native plant guide online that's appropriate to your region. Below is a list of the more common butterflies with their host and nectar plants. We've put together good selections of butterfly gardening books and plants and seeds to attract butterflies.